The liver is one of the most vital organs of the body, regulating the breakdown of sugars, proteins, and fats that enter the system. It works hand in hand with any number of other internal processes and organs, and thus when it is not functioning properly there can be devastating effects. When it is found there are high liver enzymes in dogs, this is usually through blood tests. If the liver is disrupted somehow, it may lead to elevated liver enzymes in dogs through leakage into the blood, absent in healthy individuals. By no means is determining high liver enzymes in dogs easy; it is often a confusing and frustrating process. This is caused by the nature of the liver itself. Its tie to the processes of other organs can affect the liver when other conditions are affecting the body. The liver also has a high reserve capacity, is highly resilient, and can still function when nearly eighty percent of its mass is affected by disease, thus catching a problem in the early stages is nearly impossible. The symptoms of liver maladies are difficult to pinpoint because they are often vague and share similarities to other conditions. However, with high liver enzymes in dogs being a more common and very destructive condition, it is vital to monitor any symptoms. Some of these include excessive drinking in dogs, patterned hair loss, diarrhea, bleeding disorders, and jaundice. Jaundice can be one of the underlying causes of increased enzyme levels, as well as Cushing’s disease in dogs. Once it is determined there are high liver enzymes in dogs, there are many ways to treat it—dependent on the cause of the increase. 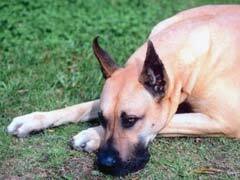 Most often this is through medication, though a vet may recommend a canine liver disease diet. This generally includes foods low in carbohydrates or fats that put more strain on the liver, and greater levels of proteins and vegetables more suited for digestion.